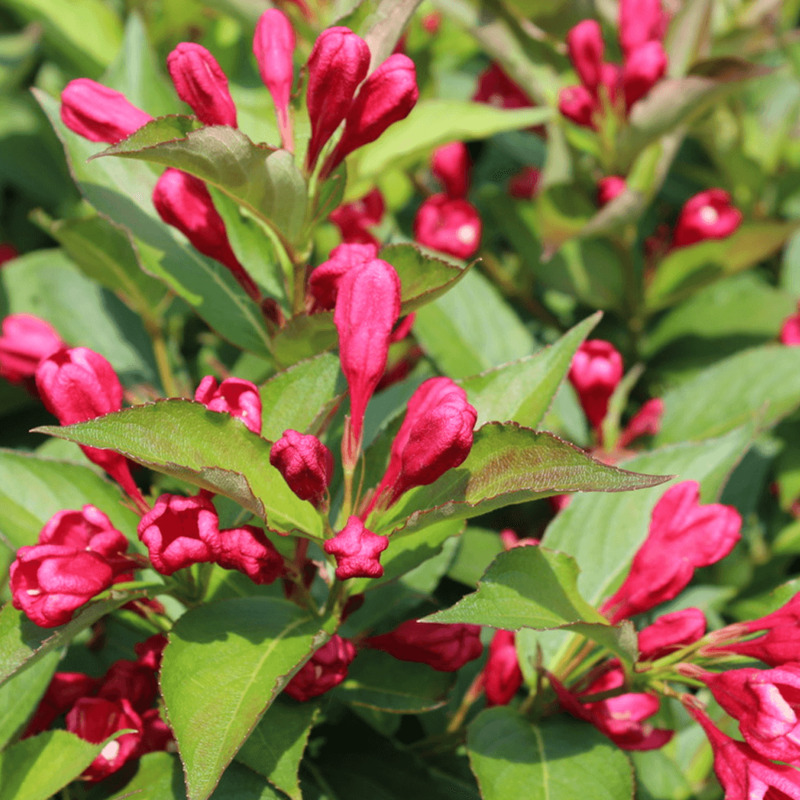 Weigela All Summer Red or Slingco 1 is a prolific flowering plant that will keep your garden look perky throughout the summer. It is a medium-sized deciduous shrub that features green foliage and beautiful crimson-red flowers. Its compact size allows it to fit garden containers although it looks brilliant when it is planted in shrub borders. This dwarf Weigela is a reliable performer and a tough plant, that will produce flowers for a long period of time. Also known as the Red Prince or Weigela Crimson Kisses, this variety produces funnel-shaped flowers in mid-spring, that are deep red in colour. It will continue to bloom flowers profusely in summer, throughout late summer into autumn. The broad elliptic dark green leaves provide a beautiful dark contrast for the bright flowers. The matured leaves often develop hues of red that provide autumn interest. All Summer Red will perform profoundly when it is planted in a fertile and moist soil that is well-drained. It can adapt to any garden soil that is relatively moist. It prefers full sunny spots where its growth will turn out to be bushier but it does perform well even in partial shade. Although it is hardy, it is not suitable for containers out in harsh winters. It is an easy to grow plant even for seasoned gardeners since it does not require a lot of expert pruning. Simply cut back or remove stems after flowering to the base of the plant. Weigela All Summer Red looks stunning as a single specimen plant that will decorate your beautiful patio. It is a real eye-catching plant that will last for years to come. It is most suitable along beds and in borders.